Preface. 1. Judging and Thinking about Probability. 2. The Study of Reasoning: Classic Research. 3. Reasoning with Propositions. 4. Reasoning and Meaning. 5. Explaining Reasoning: The Classic Approaches. 6. Explaining Reasoning: The 'New Paradigm'. 7. Hypothetical Thinking: Induction and Testing. 8. Decision Making: Preference and Prospects. 9. Decisions in Context. 10. 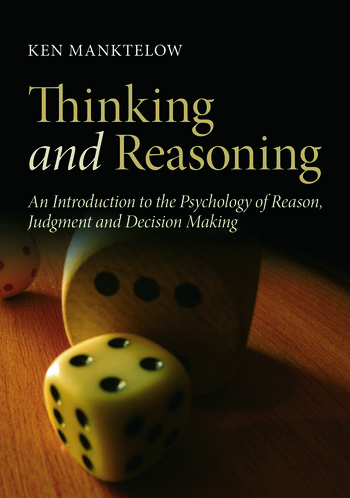 Reasoning, Thinking and You. Ken Manktelow is professor of Psychology at the University of Wolverhampton. He has worked on conditional, especially deontic, reasoning (with his major collaborator David Over), cognitive development and psycholinguistics, and is currently developing research into decision dilemmas and individual differences in reasoning.